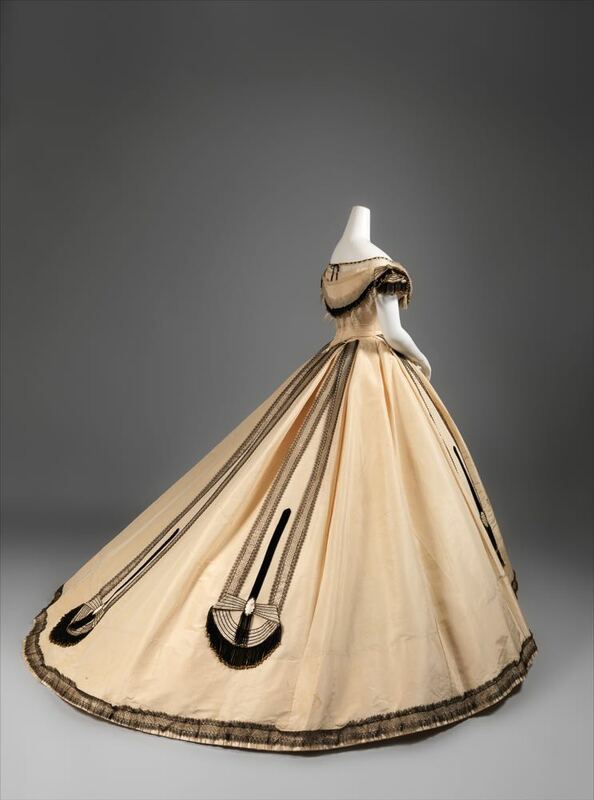 I enjoyed looking for examples of Pingat creations so much while writing my review of ‘My Official Wife’ that I had to choose one for today’s Rate the Dress. To give a contrast to the ca. 1890s fashion of Savage’s novel, and the almost-modern dress Adrian dress from last week, I went with an 1860s ballgown big enough to smuggle an entire aviaries worth of budgerigars underneath. An interesting, but not surprising, mix of reactions to the Adrian dress. I say not surprising, because I had a little spare time (for once!) when I wrote the rate the dress, and a made a list of predictions of what would be said – and you hit every one of them, from muddy colour complaints to notes of wrinkles (sans a comparison to mushrooms 😉 ). And added the bit about it reminding you of Neapolitan ice cream. I’m glad I wasn’t quite alone in thinking that a bit of mint makes Neapolitan so much better. And that’s what happens when a bunch of people give threes and even more people give 10s! The black and cream colour scheme combines to popular trends in ca. 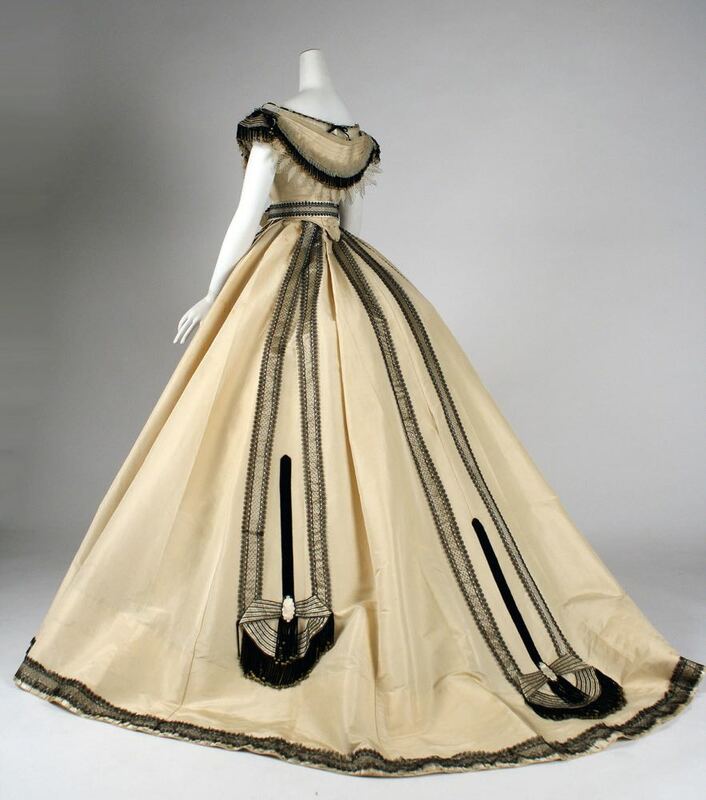 1860s fashion: pale colours for evening wear, so they showed up well in poor lighting, and high contrast trim. The combination of textures is another highly fashionable touch, with delicate gauzes contrasting with rich taffeta. 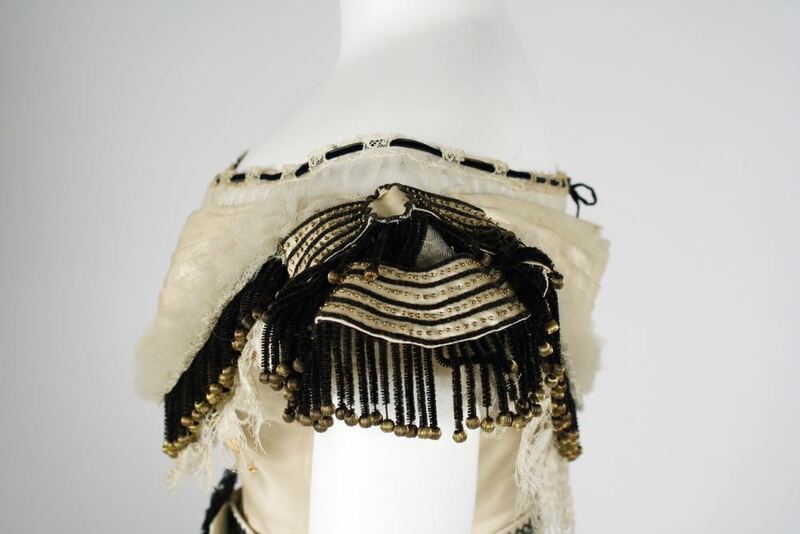 Lace in black and warm cream, ribbons, ball-end fringe, and tiny gold beads add further visual texture, sparkle, and movement. Note the way the berthe wraps across the back bodice, hiding much of the bodice lacing. Note also the double lines of piping finishing the bottom edge of the bodice. 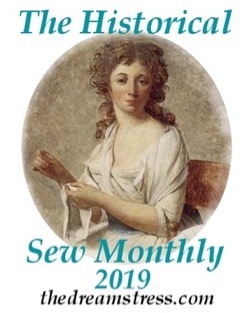 Double piping is sometimes cited as a Charles Frederick Worth innovation, or at least a specific mark of the House of Worth, but it’s seen on many high end mid-19th century garments including ones that predate Worth. What do you think? One for the record book, or forgettable? 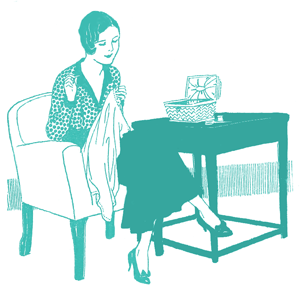 A reminder about rating – feel free to be critical if you don’t like a thing, but make sure that your comments aren’t actually insulting to those who do like a garment. Our different tastes are what make Rate the Dress so interesting, but it’s no fun when a comment implies that anyone who doesn’t agree with it, or who would wear a garment, is crazy/totally lacking in taste. Look up here, it is STILL my brests! I don’t know, wether it is the mannequin or the dress is really so disproportional, but it just looks off to me. And those bookmarks on that skirt don’t help either. Oh my paws and whiskers! It’s magnifique! I adore the way the black trim is a little misty so it contrasts but softly, like a pointillist pen and ink sketch on parchment. All those sweeping lines, like that same ink pen – the skirt, the graceful drama of the bertha, and the little touches of sequins and lace. Yum. I adore the bookmarks- so structural yet graceful. the sequin black trim is so much more subtle than a hard black one would have been. 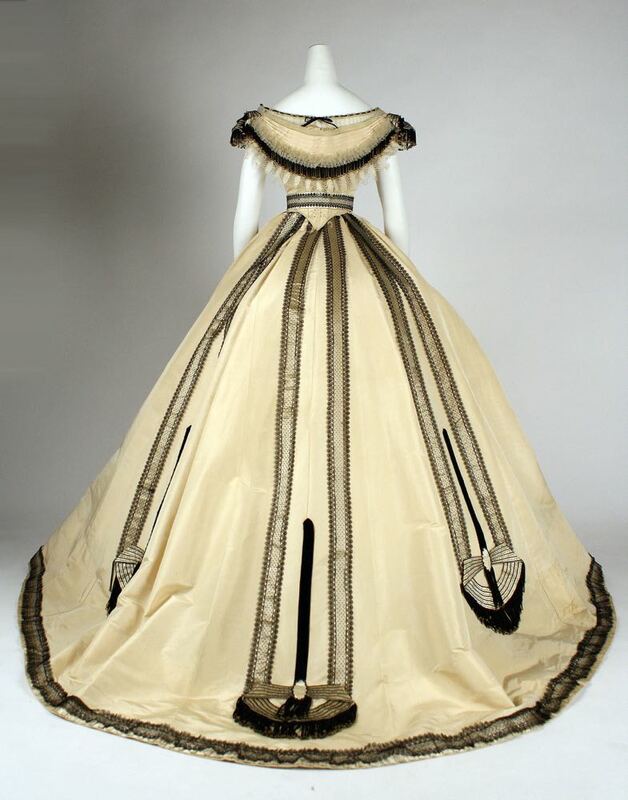 I just cannot fault it – I love black and cream dresses in any era. 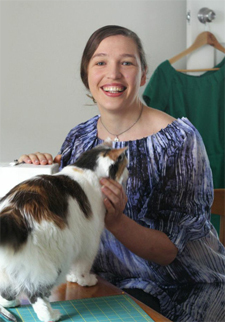 It is a fitting grand mama to the Laurel Dress! 10. 10! 10! 10! 10! 10!!! I am decidedly *NOT* a fan of this era; too froofy, that ginormous crinoline, too saccharine, etc. but this is absolutely, fantastically glorious. Delicate without being too sweet a confection (that dark contrast), not too contrast-y (the bits of gold and the sheerness of the lace ribbon divide the tone, so there are layers of light and dark). I can imagine how this glowed in candlelight and the bits and bobs swayed with movement and dancing. That black ribbon woven through the lace at the neckline edge with the bow at the back? DED. I’d squeeze into a tiny corset to wear this, no questions asked. Just perfection! 10/10! Love everything about it. 10/10 That colour scheme and tiny waist get me every time! I do like the color scheme and am impressed by the overall skill of the construction, but I find I like only certain elements (love the lace, for instance), but don’t like the ensemble. The bookmarks reminded me forcibly of a creature like the lyrebird, waggling its tailfeathers to impress. That was the function of these ball gowns. 9! I’m a sucker for high contrast, bold design elements. Love the use of black to create an almost architectural effect in the gown. One point off because the gauze in the front is not necessary and weirdly softens the front… I like full-on BOLD! Oops! put my rating on the first line. Hadn’t been here in a while. Just read the new rules. It’s not a rule, just a request because it makes it a lot easier when I tally them up 🙂 Your 9 is nice and easy to read – sometimes they got put in the middle of a paragraph and I missed them. Welcome back! Great to hear from you again. Love this. Big hoops or small. This is so fresh looking. Somehow sensible with a bit of lightheartedness. Ohhhhhh…. this is just dreamy! Elegant yet bold. The bodice amuses me with the way it gives an impression of an utterly massive bosom, the kind that makes you look twice. The skirt decorations do look like bookmarks on the back, but I thought at the front it looked like she had poi tucked into her waistband. Can you imagine kapahaka in this? Tahi, rua, toru, wha! I agree with some people in this comment section- this dress is amazingly beautiful and combines drama with a subtle understatement. 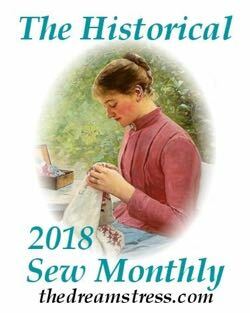 With my usual pedantic fussiness I could complain that the front bodice bertha is a little bit jarring but after all, the effect changes completely when a dress is worn. Just saying, I much prefer the larger hoop although it still looks amazing in the smaller one. I think the sheer boldness of wearing the massive hoop really commands attention, just like the dress itself draws the eye in. I’d hate to be standing in the same room as someone wearing this because if this dress is there, where else would you look? Stunning from every angle. I love the black and cream colour scheme, and the mix of textures in the trim is exquisite. I think that the gown is beautiful. The ornamentation is tastefully understated and lovely–I especially liked the bead fringe on the shoulders. Though the skirt is large, it is well-proportioned and does not, in consequence, look absurd (or at least, not as absurd as such a wide skirt should look!). This time, my only complaint is the color. It’s pale, and not quite yellow and not exactly orange. Probably only a brunette with a warm skin tone would look right in it. No matter. I wouldn’t wear it myself (even if scaled to my shortness), but it still deserves a perfect score. 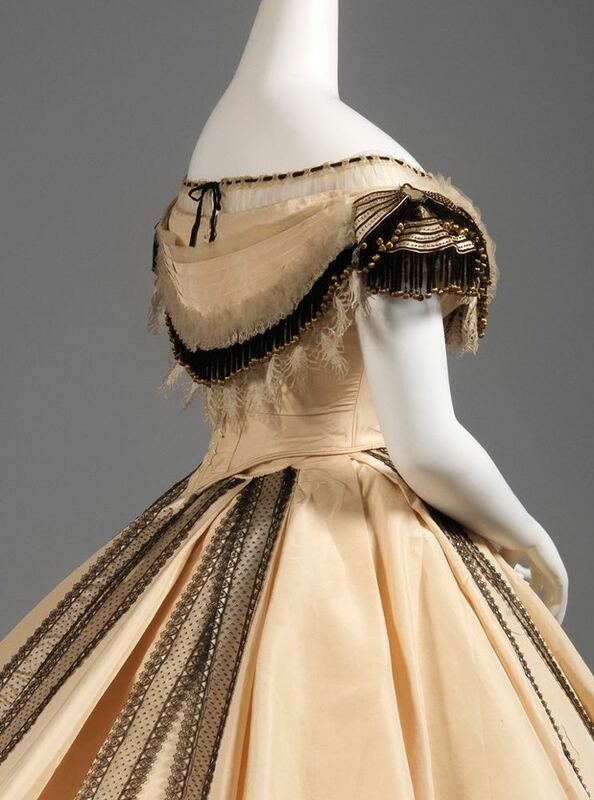 I love the story about Empress Eugenie, who was noted for her huge crinolines and extravagant approach to fashion, sometimes wearing two evening gowns on the same occasion. Apparently, she attended a satirical theatrical show that was mocking the enormous size of the crinolines she used in the 1860s. An actress appeared in a gown with a gigantic skirt. 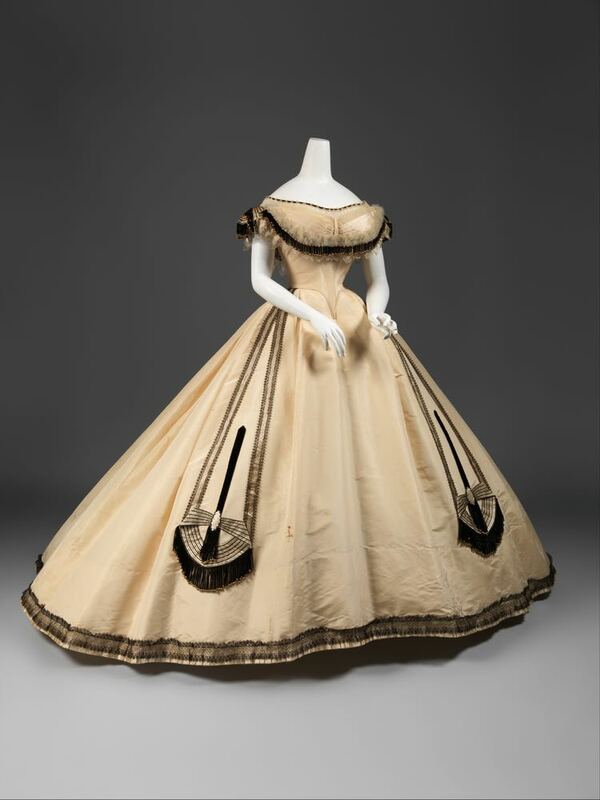 Apparently, the Empress, instead of feeling ashamed or abashed that people were mocking her, asked afterwards for the name of the costume designer, so she could order a gown with such a massive skirt. I think it’s lovely. Delicate and swooshy and the colours contrast beautifully. Beautiful! Strikes me as rather minimalist for the time but stunning. Lovely! The whole thing is beautifully detailed without being overly fussy. If this dress has any faults it’s the conical skirt and massive hoops, but it’s easy to see how the lovely trim on the skirt would get lost in the folds of fabric that would form if the hoops were much smaller. I’d like to see a 1920’s or 30’s version of this dress; the trim is very art deco. 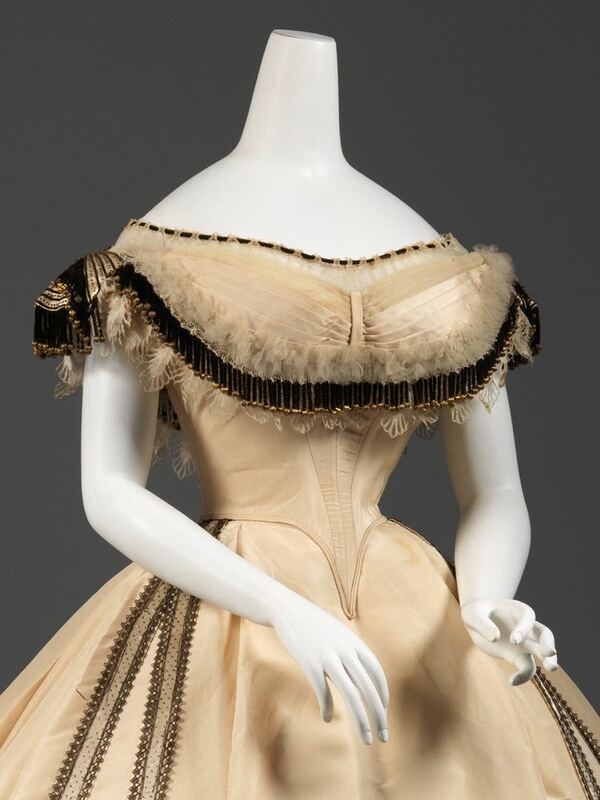 I too would happily wear the tightest of corsets if it meant I could also wear this, although, I think it would also make the most delightful camping gear; I would like camping so much more if I got to sleep inside such a pretty and spacious tent! 10!! That’s a great idea to reinterpret this as a 20s/30s Deco dress! What a beautifull dress! Some sweet embellishment like the ruffles and fringes in combination with geometric lace placement on the skirt. Perfect. I see a dark hair lady fly over the dance floor in a waltz. I like this one. The fact that it has black lace really helps, as I have a weakness for it. The only thing I’m not entirely sure about is the geometric design on the skirt decorations. My daughter and I decided that as she is only nine and not old enough to attend balls, the best thing to hide underneath such a dress would be her in her own gorgeous hoop dress. We give this amazing creation a perfect score, assuming it comes with a jet black fan because hiding someone under one’s skirts would raise one’s temperature somewhat. Oh, I almost forgot…this would be an excellent dress for a robbery, you could hide your accomplice, all of their gear and the loot and swish out with no one the wiser. I think this is just lovely – except for the bertha making it appear the wearer has the most massively enormous bust in the universe. It strikes me as being so grotesque that it utterly ruins the rest of the dress for me. It turns what would have been a ten into a one – it is that out of proportion to my eyes – and the low score isn’t really fair to the rest of the dress. For that reason I am giving no score, while whimpering mournfully into my morning tea about what could have been. Wow … there are pleats, ruffled gauze, folded epaulet sleeves, beaded chenille fringe, more gold beading, lace appliqué, a fringe of dangling lace leaves, a velvet ribbon drawstring neckline, self-fabric appliqué, velvet ribbon appliqué, and chenille cording. On a high contrast dress with a humongous crinoline. In less skilled hands it would be a hash of details. But it’s a Pingat and he can pull it all together into something elegant. For the era and occasion it’s perfect. And the detailing is impeccable. That’s so funny! I went Pingat-hunting after reading your previous post, and this happened to be one of my favorite examples! I am a fan of both high contrast and layering of textures in a single color, and this knocks my socks off. I especially love the swaggy ends of the skirt motifs. This baby deserves the biggest hoop it can get. I’d want to sweep it all around the ballroom. Near perfection. I love the graphic architectural details, perfect colour scheme. I especially love the shoulder and back details. The beaded tassels are exquisite. 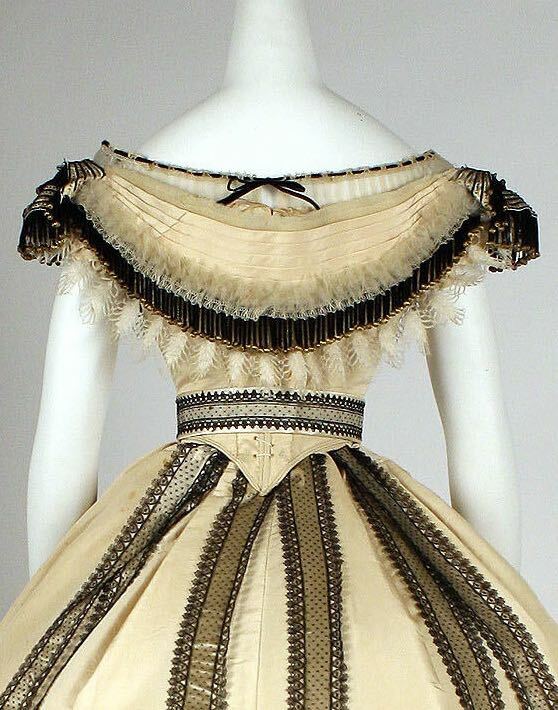 Quite lovely, with unusual bead-ended fringe to set it apart from other dresses of its time. I would certainly wear this and feel very elegant! I can’t fault this dress. It is the perfect combination of hard and soft, and the black deco-ish details on the cream silk just slay me. And with a dress this beautiful, it’s absolutely go big or go home. I would wear it with the very, very large hoop. Can you imagine how this silk would glow in candlelight? Dreams are made of this dress. Light and dark, sheer and opaque, clean lines and fussy detail. I love it all – with the exception of the bust enhancer swag. I appreciate that it balances the silhouette of the gown but compared to the restraint of the rest of the design it seems a bit vulgar. I can see other guests choking on their punch as they caught sight of this gown and the satisfied smile of the woman who wore it. Very nice! There’s a lot going on here, but it’s all very tasteful and well balanced. I love the use of colour and line, and I’m always a sucker for geometric trim. 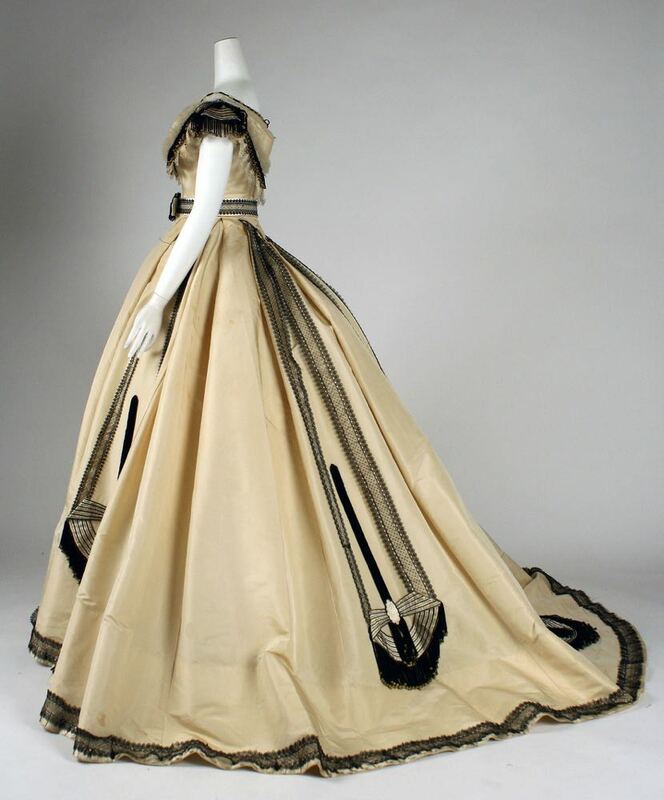 If I were to ever walk down a grand staircase, I’d want to be sporting this breathtaking gown. There’s just enough embellishment to make it alluring, but its size is what commands attention and admiration. Every little detail seems perfectly planned from the pleating to the beading. Thank you for pointing out the double piping on the bodice. I quite like the ‘bookmark’ motif down the backside too. I would love to see how this dress would move on the wearer. The dress seems to be in pretty good condition as well. Is amazing what happens to survive the test of time.